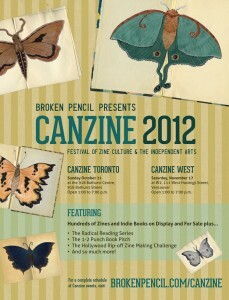 Happenings – Canzine Toronto 2012 this Sunday! Just a reminder to set aside a few hours for Canzine Toronto this Sunday! You’re extremely likely to find a future Gene Day Award winner at the show, and it’s a great opportunity to meet our best indie cartoonists before they get “discovered”. Lots of great panels as well, check out the full breakdown at Broken Pencil. This entry was posted in General Announcements by Andrew Walsh. Bookmark the permalink.